Best movie ever! Love musicals, just simply amazing. Love every song and the dancing is incredible also. If this movie bores you, you have no taste. Wonderful story with many unexpected twists! I loved all of it. Only movie I have EVER watched '5' times!! Absolutely AMAZING job by director, and all of the cast gave 100%! I LOVED IT!!! Absolutely wonderful movie. I am going to see it again for the 4th time. Wonderful uplifting story with terrific music that leaves you in a joyful, happy mood. It was good but did not expect it to be a musical. Reminded me a lot of La La Land but I knew that was a musical. Would have preferred much more dialogue and much less singing. Otherwise, a touching show that was well done and wholesome. Proves again that crude language, sexual content , and violence are not necessary for a good film. AWESOME! Love it. Loved the music, story, costumes and the dancing! Everyone did a great job! Can't wait to watch it again! Simply magical! Amazing cinematography, beautiful music, spellbinding choreography, everything about this movie just engulfed me! this show was awesome really enjoyed the characters and the story. The music and cast were all awesome!!!!!!!!!!!!!!!!!!!! Hubby and I just saw this film for our 60th AND 61st times tonight -- 15th & 16th sing-alongs -- and we still LOVE IT now just as much as the very first time! We had to drive an hour and a half to get to a theater where it's still playing, but it was well worth the drive. And we even ran into other folks who came out from our area for the very same reason! We're all thinking this may be the last time we get to see it in the theater, so we had to make it count! Best film EVER!! Best movie I've seen in a long time!!!! Excellant movie, will buy it when it comes out on dvd. Fantastic. Not so much a fan of musicals, but this one is unforgettable. Have seen it 4 times will by it to watch forever when it comes out and already have the music. Its not meant to be anything but entertainment and it succeeds at that magnificently, Heartwarming, fun, exciting choreography, music that stays in you head for months after, great casting, it is just a wonderful, fun experience. Going to see it again tonight. Love this movie, on 5th viewing...... Music is addictive. You leave feeling happy and joyful. A very uplifting movie! If your looking for swearing or violence don’t go! But if you want to leave the theatre feeling great, go! A lot of people were clapping when it was over. I’ve seen it twice and looking forward to buying it on DVD when it’s available! loved this...the music and talented actors were over the top! Split. I really enjoyed it. Great music and storyline. My wife didn’t like it and was bored. I would r comment but my wife wouldn’t. So I think it’ll depend on your taste in movies (and the circus!). Absolutely loved it. I've seen it three times. The music is uplifting and catchy. Acting is phenomenal. I have seen this movie 6 times. I am not a person who would do that ever! The story, music, and the chemistry of all the actors/characters is what makes the movie outstanding! Plus it is for all ages. 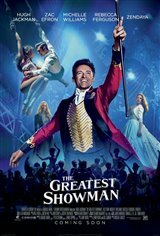 The Greatest Showman is a one of a kind,fantastic show! I also bought the soundtrack. I absolutely loved this movie! The actors did an incredible performance all the way through. I love the message of the movie as well. Excellent and very entertaining if you like musicals. I HAVE THE CD OF THE GREASTEST SHOWMAN AN I SING ALONG WITH IT ALL THE SONGS WERE JUST GREAT. THE SONG THIS IS ME SHOULD HAVE TAKING AN OSCAR FOR IT. I HOPE THAT EVERYONE AS A CHANCE TO GO SEE THE GREATEST SHOWMAN. I AM GETTING READY TO GO SEE IT AGAIN. One movie that a person can come away from feeling happy. Music, dancing everything just wonderful. Seen it twice and ready to go see it again. Absoultely loved this movie!! Wonderful feel good story and excellent music. I am still singing and dancing. Hugh looked like he loved his part. His family values came through. Best feel good movie I've seen in years! Can not stop singing/humming the songs! I’ve never liked the circus and I’m so so about musicals. However, I LOVED this movie! It will endure the test of time, like the Wizard of Oz, only much, much better because it’s for all ages, not just kids. Powerful messages of family and kindness. The music is truly unforgettable. Add a very talented cast and you’ve got a winner. I’ve always admired Hugh Jackman as a truly good human being and this movie that he created truly shows that. This will be a timeless classic, enjoyed by families in the decades to come. It’s clean and has a powerful, positive message. It moves quickly and the music is fantastic. I hated to see it end, unlike many other movies I’ve seen. I highly recommend it. It’s a feel good movie for the whole family. a decent family movie with great dancing, music, energy! Loved the music, choreography, and the pace of this movie. It had a good message, but the film plodded along and was all over the place and one just did not care enough for the characters. The music was contemporary and the film was made of vignettes, like strung together music videos with lousy contemporary bad show music, which did not sync with the rest of the movie's style, and took the viewer out of the moment. Not the performers fault, but the producers and director's misguided judgement. The film is effortful and cringe-y to sit through, though the visuals can have beautiful moments. One of the BEST movies I’ve seen in a long time. So refreshing to see a movie that isn’t full of garbage and negativity. Highly recommend! Such a great movie. The whole family can enjoy it. I will go soon for my third viewing. Then buy the BluRay! Great show. The critics were wrong about this one. It was based on PT Barnum just like the Sound of Music was based on the VonTrapp family. It wasn't meant to be a documentary. The movie was very uplifting and I would go again. Amazing choreography, music, storyline, and positive messages. I have seen this movie 44 times and will continue to see it until it is removed from theatres. I love the passion put into this film. Awesome movie!! Seen it 5 times so far + planning to see it again soon. Amazing music + some great dancing! Best movie I've seen in a very long time. Excellent!!!!! Best movie I've seen in a long time. Best movie ever. Must see more than once. Loved this movie, Hugh Jackman is great. Cinimatography, music, acting (the cheesy parts made it so good and tasty) THE MORAL BEHIND IT, THE HUMAN SPIRIT AND INTERACTION, the dancing, and the dang best music ever performed in a musical. Right up there with Phantom and Evita. Little Mermaid and Beast; Broadway and Movie.